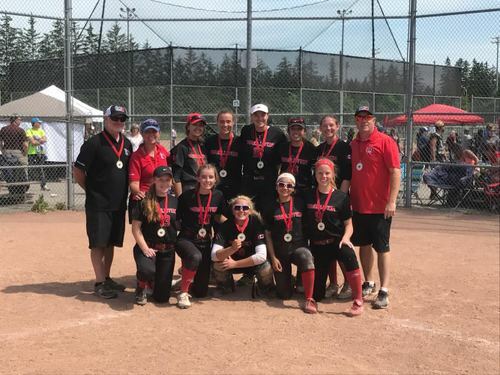 UTM 2K2 team won Gold for consecutive weeks in Ontario tournaments building off of their medal win at the Waterloo tournament, the team led by coaches Randy Drover, and Ryan Hall went a perfect 6-0-0 in Barrie this weekend to capture the Gold medal at the Barrie Bash U16 Tier 1 tournament. In the opening match Friday night Revolution played a very tight game vs the Oakville Angels 03 squad, a real pitching duel and the score reflected just that as UTM prevailed 2-0. Saturday AM, the first game saw some good offensive at bats as they team defeated Mississauga North 10-1. The 3rd and final pool play game allowed UTM to play the Quebec Rebelles squad, and the final was UTM 7-0. With the 1st seed secured the playoff round started on Saturday evening… and in the opening round 2K2 stormed back from an early 3-0 deficit to defeat Waterloo Ghosts Black by a score of 13-3. Semi-final Sunday morning was a re-match of the Friday night game, and once again Revolution got a great pitching performance in a 7-0 victory. The gold medal final was also a rematch of a pool game as Mississauga North Tigers battled hard to get to the final match. A tight game until the 3rd inning, and in the end UTM won the game by a score of 8-1. McKenna Kelly pitched 5 games, and allowed only 5-runs over the entire weekend. Mikaela Moore also did well on the rubber, pitching 8 innings of shut-out ball. The offense was sparked with some key extra base hits from Jessie O’Donnell and Tanis Drover, but really from top to bottom every person in the line-up contributed with some timely at bats, etc. Makenna Hill had an AB, in which she fouled off 10 straight pitches.